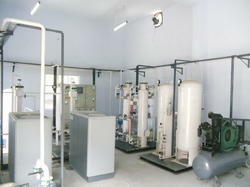 We are Manufacturers & exporters of Medical Oxygen Gas Plants. Molsieve Medical Oxygen Plant are fitted with Fine Bacteria Filters on the oxygen line to the hospital hence ensures impurity levels of 0.01 microns in the oxygen line. Molsieve Medical Oxygen Plants provides you enormous relief as no hassles of oxygen bottles handling, no department to maintain inventory & accounting. By just pressing one button Oxygen is available when required.Molsieve PSA/VPSA Oxygen is safe & meets United States Pharmacopeia (USP) XXI Oxygen 93% Monograph. Molsieve Medical Oxygen Plants are fabricated in accordance with all relevant codes (ASME, ANSI, NEMA), and can be configured to meet CRN and CSA standards. Each system can be operated without extensive technical knowledge or training. Easy to follow manuals and on-site training will teach your staff how to properly calibrate and maintain the system. Routine maintenance is as simple as normal air compressor upkeep and filters change. Every plant is PLC controlled, the PSA Adsorbers are filled with Zeolite Molecular Sieves and factory sealed and rarely needs replacement till about 5 years. Equipped with a continuous purity monitoring system, this device ensures that the medical oxygen’s purity and concentration of oxygen is within acceptable limits. In case of any abnormality, plant can be switched to back-up system. The Molsieve Medical Oxygen Plant gives you convenience of switching on an off the oxygen supply by pressing a button only.Provides, independence from handling scores of oxygen cylinders or Liquid stations. The plant is designed to run 24 x 7, 365 days a year as plant made with mandatory standby arrangements for all the moving & critical components. The Molsieve Medical Oxygen Plant works on a low pressure of 4.5 Kg/cm2g, however a Booster is provided to fill ‘B’ or ‘D’ type Oxygen Cylinders for emergency use in Ambulance or during shifting of patients. Since Molsieve Medical Oxygen Plant requires only Power and Atmospheric air, it can be installed in any remote area or on any altitude where neither Oxygen Bottles nor Liquid Oxygen can reach in appropriate time. 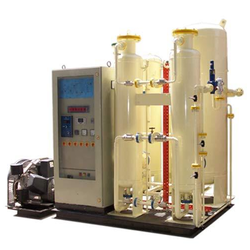 PSA/VPSA technology is employed to manufacture Oxygen Gas Plants as the compressed air is passed through an air filtration & drying system & the air is conditioned well before the dual bed system contains special grade of Zeolite Molecular Sieves as desiccant which has a preferential properties for adsorption of moisture first and then Nitrogen and other gases present in air. The adsorbers are being operated at an interval of one minute, one after the other and in re-cyclic mode so that the Oxygen is produced on continuous basis. Both the Adsorbers are interconnected with 7 valves scheme which operates automatically with the help of sequencer. The Oxygen produced is collected in a reservoir called Surge Tank. A Vacuum pump is also associated in large capacity plants in order to improve upon the regeneration process. A Storage tank is also provided which supplies the Oxygen to entire hospital through a pipe line. A gas booster with desired cylinder is also provided on demand if cylinders are required to be filled. It is a tentative however the consumption depends upon several other factors as well. Molsieve Designs Limited has brought forward Medical Oxygen Gas Plants for our esteemed clients. These plants have gained acceptance on a wider level for providing easy availability of oxygen supply for fulfilling the hospital needs. Our customers can assemble these plants in a trouble-free manner as per their convenience. We are offering these plants to cater to the diversified needs of our customers.